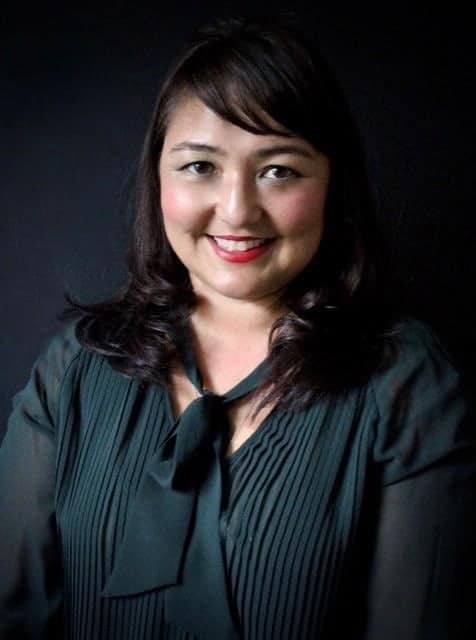 Designer MK Nance first popped on my radar (AKA the Indie Untangled Marketplace) at the end of 2014. 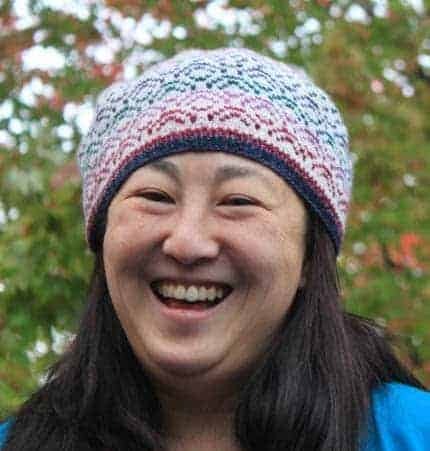 Since she tends to design her accessory patterns with indie-dyed yarn, she was a perfect fit for the website and also for the Where We Knit Yarn Club, in which I pair together dyers and designers, who collaborate on an exclusive colorway and one-skein pattern. 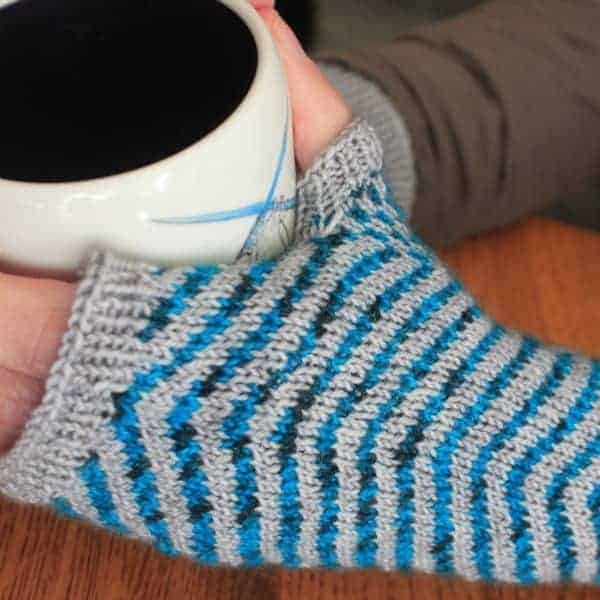 For last year’s club, Nance bended the rules slightly and used two half skeins of Three Fates Yarn Terra Sock to create not one, but two patterns with a two-color cable design that has become her trademark. The Crystal Springs cowl and Jenkins hat are now available to purchase. 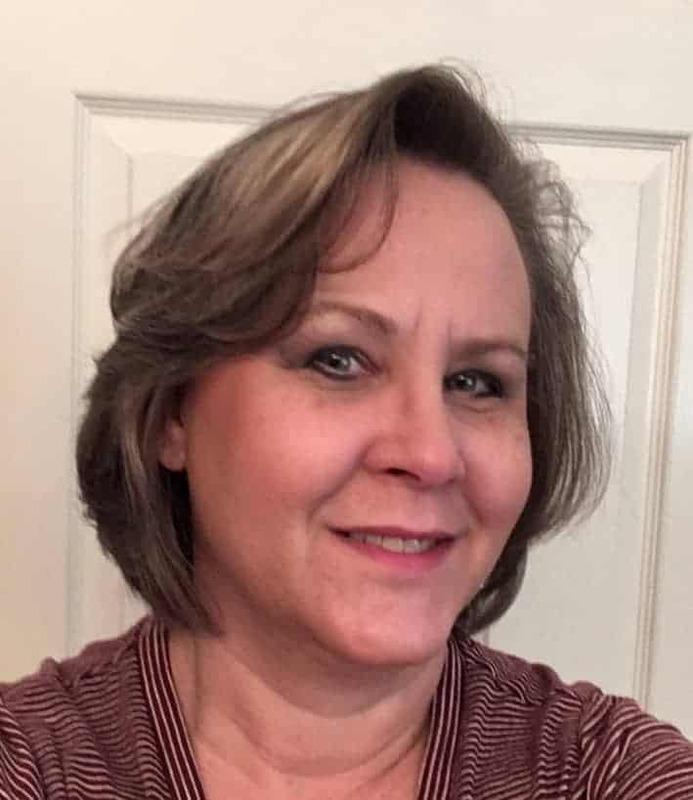 I recently asked Nance to tell me a little bit more about her work and inspiration. I just did! 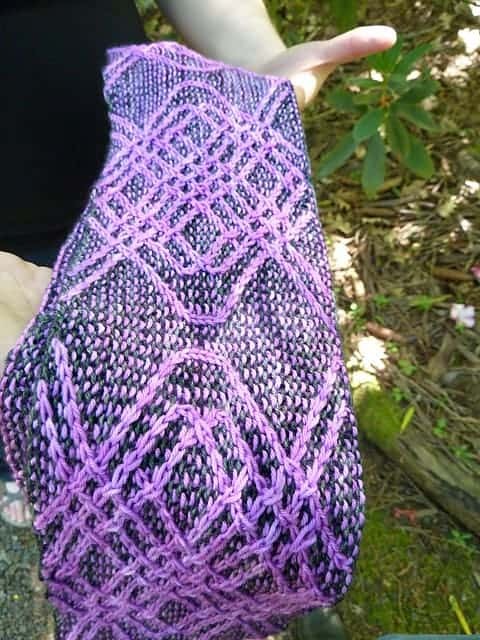 The first pattern I wrote was because I couldn’t find a pattern that I needed to make and friends’ friends asked me to make it for them so I wrote the pattern up and said I would teach them. 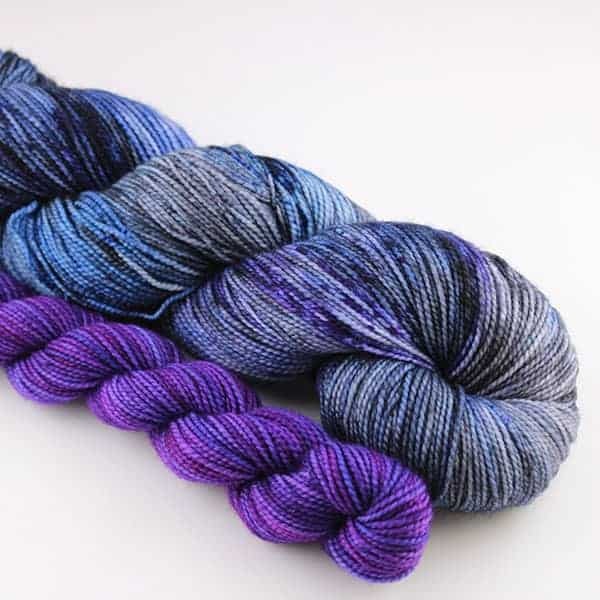 Two dyers, Three Fates Yarn and The Periwinkle Sheep, both suggested I just do it. The first thing I ever designed was a scarf was my sophomore year of high school, so I had not really done anything at that point. I studied anthropology and middle eastern studies in college. After that I lived in NYC, Cairo, and Portland, Oregon. Many names and motifs are inspired by where I have been or studied. Mrs. Struk, my first and second grade teacher, kept me in during recess until I learned how to tie my shoes. That didn’t work so she took my mother aside and told her I needed better eye hand coordination, so knitting or crochet would be good to learn. As my mother can’t crochet she taught me how to knit. My shoes are never tied still (I can tie them now) but I have knitting in my purse, car and everywhere. Honestly, if I knew I would have an easier time coming up with names. If it will be self published, I’ll pull out the yarn and start painting stitches using my graphing program. If it for a call for a third party publisher, I’ll pull up the mood board and paint stitches. My favorite colors have not changed. 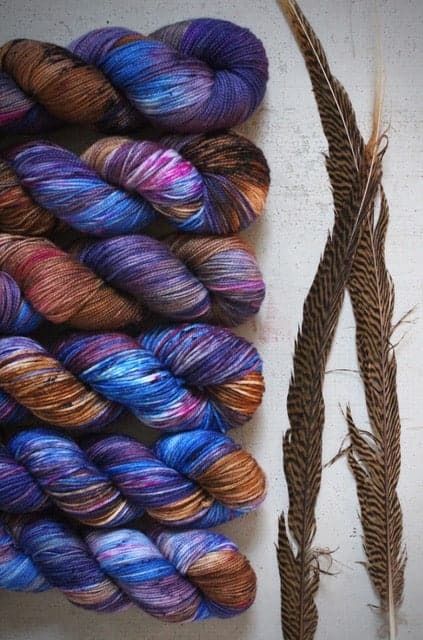 I do use color differently, I once loved lace and variegated colorway but now I’ll use busier yarns with a solid with stranding or mosaic. 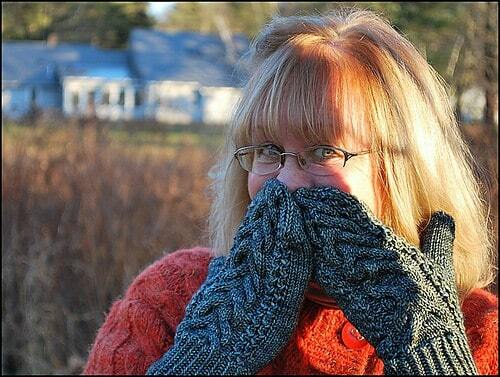 You recently published your first sweater design in Twist Collective. 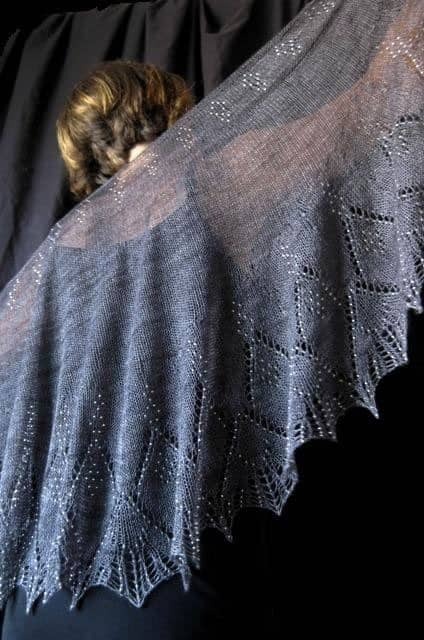 Do you plan to design more garments? Absolutely! I am planning on releasing at least three more cardigans this year. I may also have a few pullover ideas bouncing around my head. I have two. Farina’s is a little bakery in Portland with great light, food, and the staff/owner are great people. Home is my other favorite place with my dog literally under foot. 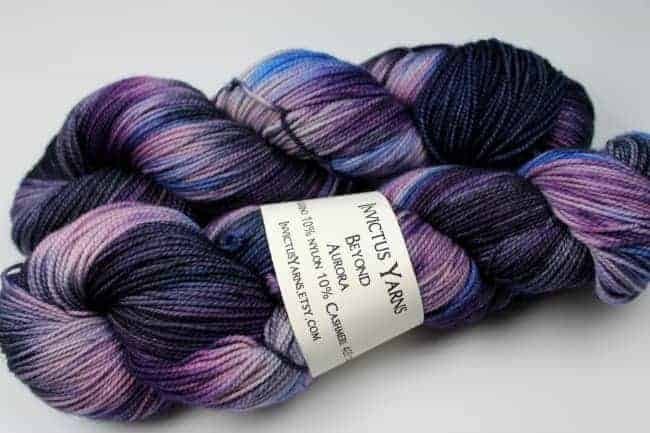 Sue of Invictus Yarns was one of the first dyers I reached out to when I began putting together Indie Untangled four years ago. 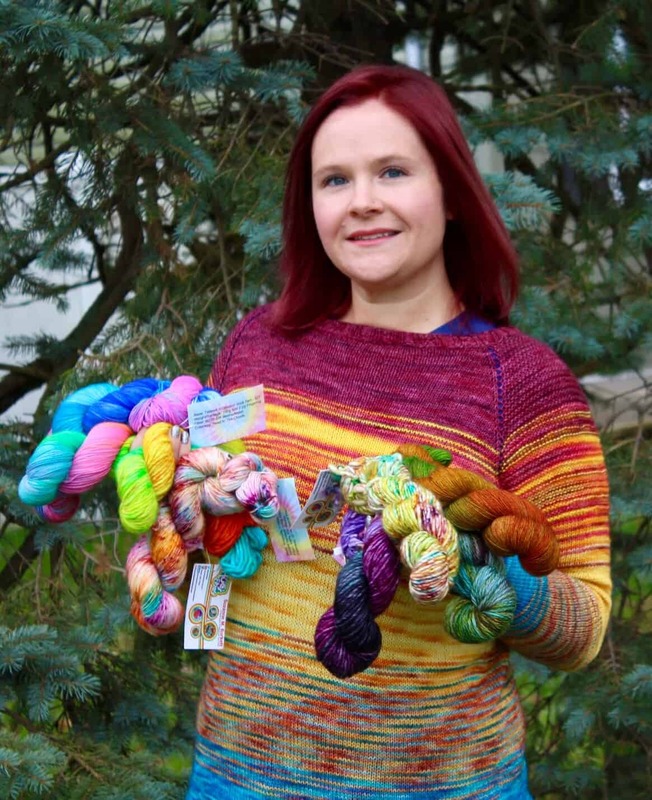 Since then, she has become one of the most prolific posters, with a beautiful range of products that include her standout gradient and rainbow miniskein sets and expertly dyed variegated colorways. It was something that seemed fun to try. 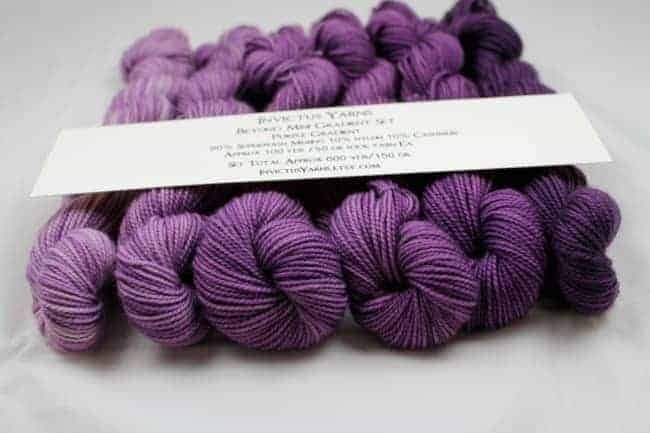 A few people asked me to dye skeins for them, too, and before I knew it, I had a shop and had a booth at Lambtown, a local fiber show. 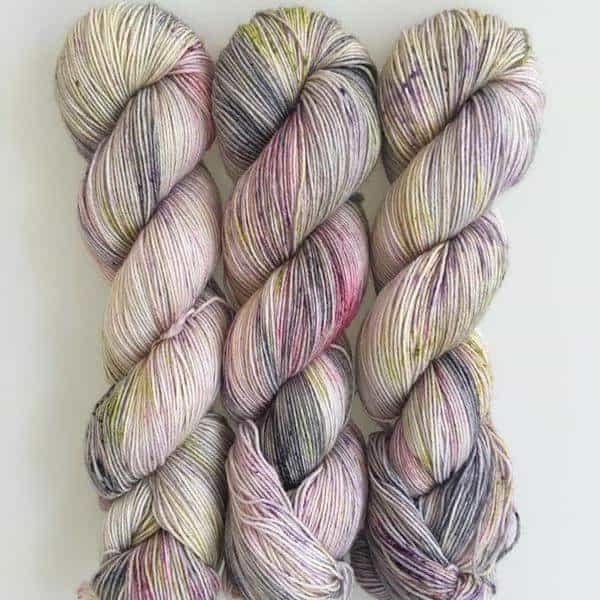 I haven’t looked back, and have discovered that I really enjoy my time in the dye pots! 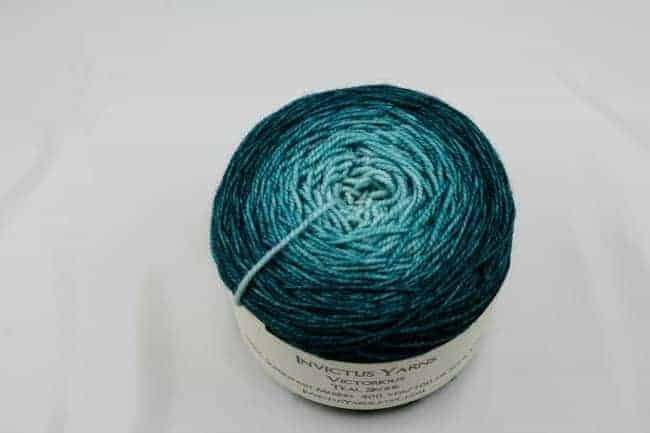 How did you decide on the name Invictus Yarns? The feelings of strength, courage, and determination that came with with the process were just amazing, and I wanted something that would convey them. As soon as Invictus came into my head, I knew it was the direction I wanted to go. 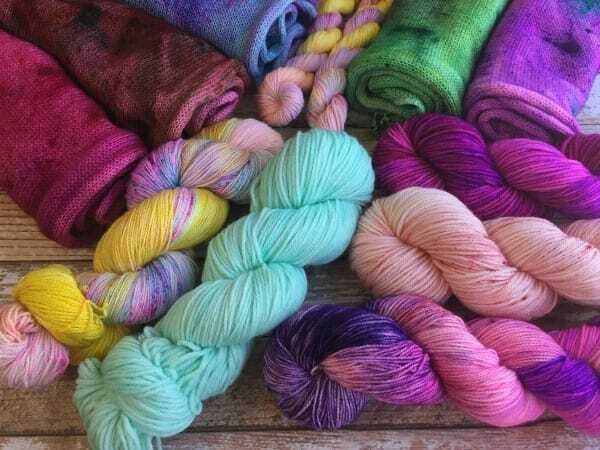 I get this question fairly often, and am almost embarrassed to give a truthful answer, but for the most part, I let the skeins hang to dry and let them tell me what they want to be called. Sometimes I’ll have an idea before I dye them, but for the most part, the name comes to me after they’re dyed. Purple is definitely my favorite color, but I’ve always loved jewel tones. I was never a fan of oranges, but have to admit that it’s become a fave lately. It seems like I’m always on the hunt for the perfect red. 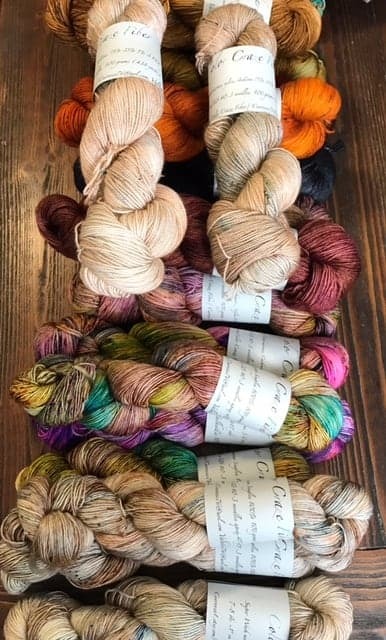 I don’t think I really realized how many different shades there were before I started dyeing! I think the biggest challenge is often with getting accurate pictures for the shop, especially for reds and greens. It varies, but usually several times a month. I still have another job, but have cut it down to just a few hours per week so that I can spend more time on the shop. Dyeing is definitely my main business. I think that changes every time I see another project! : D I love seeing the projects on Ravelry and at shows! 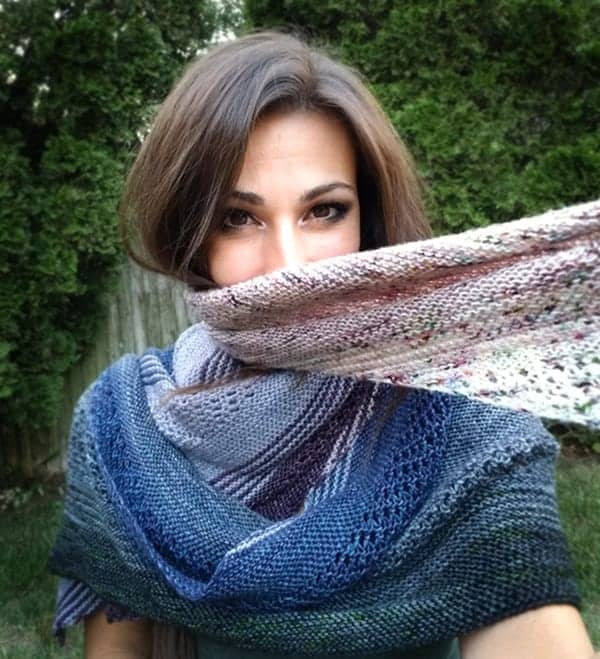 A Phoenix-Wing shawl that was knit for a booth sample will probably always be one of my faves, tho. It was like wrapping myself in a giant hug when I opened it. Hmmm. 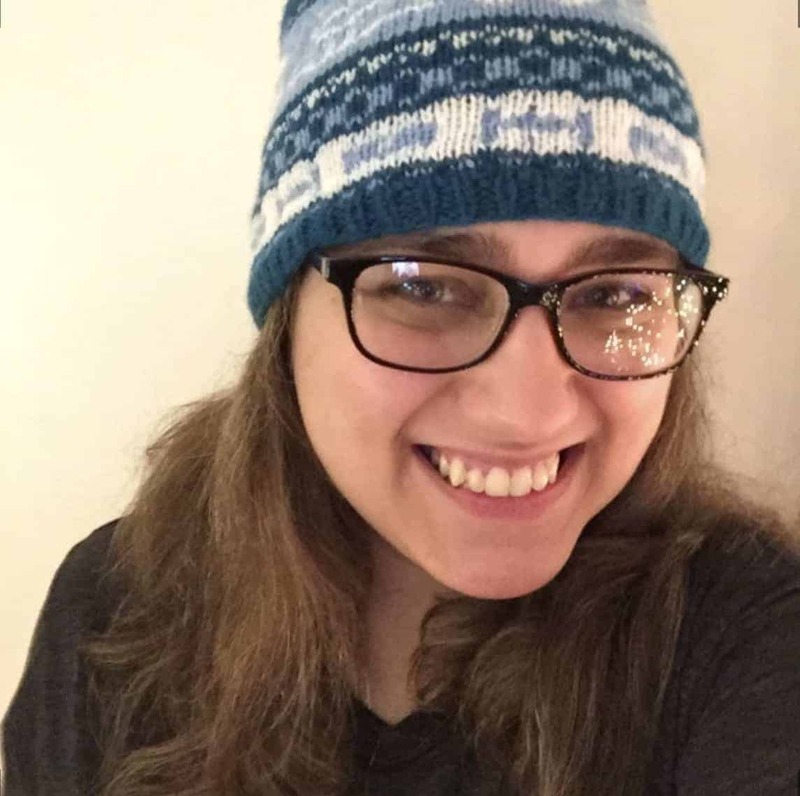 This may sound really silly, but it’s the first thing that comes to mind: I felt rather awkward when I began doing fiber shows, but learned that it can be a real blast to chat with people. As an introvert, that was a biggie, even if it sounds pretty basic. It also goes along with the whole Invictus strength-courage-determination thing, now that I think about it! It can still be a challenge trying to determine how much to chat and how much to let people just browse without coming across as though you aren’t acknowledging them, if that makes sense. 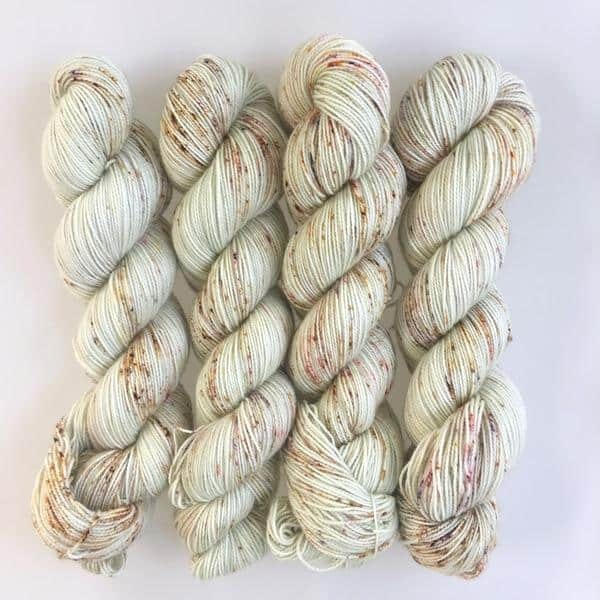 This is the second post in a series introducing the dyers who will be featured at the second annual Indie Untangled Trunk Show at Woolyn Brooklyn, taking place December 1-3. 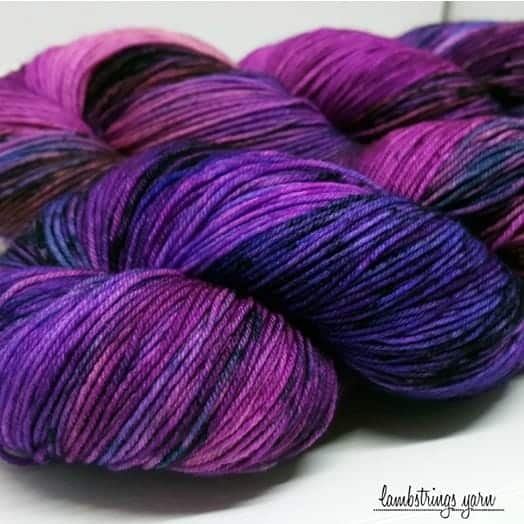 It’s always exciting to find a new indie dyer whose colors you love, but it’s even more exciting to learn of one based not too far from you. 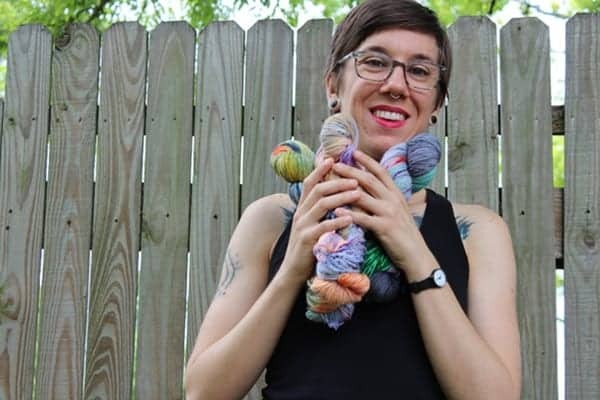 Shanna Felice runs Lambstrings Yarn from her home on Long Island. 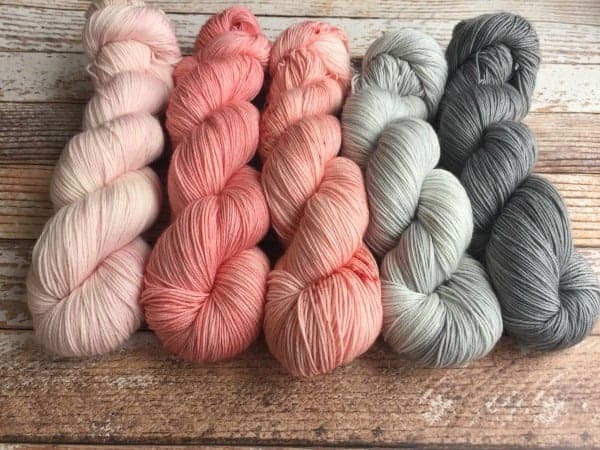 She’s been a fixture at the Long Island Fleece and Fiber Fair held every May and I recently got to see her yarns in person at the sixth annual Kings County Fiber Festival in October and was blown away by her soft semisolids and lightly speckled colorways. 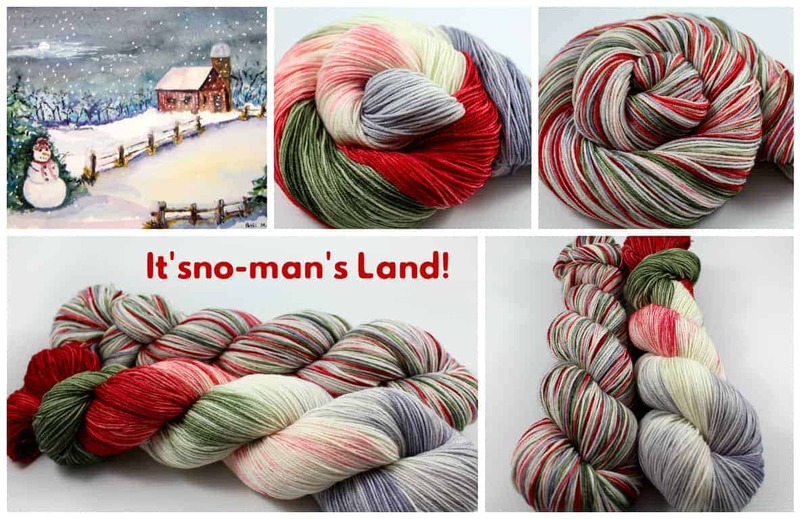 I’m sure you’ll also fall for them when you see Shanna’s yarn at Woolyn. I went to school for Fine Arts and earned my MFA with a concentration in painting. During that time, I was knitting for leisure between paintings and schoolwork. It was a great way to clear my head while continuing to create. Some time after graduating the masters program, I just felt I needed a break from the formal art world and my paintings. 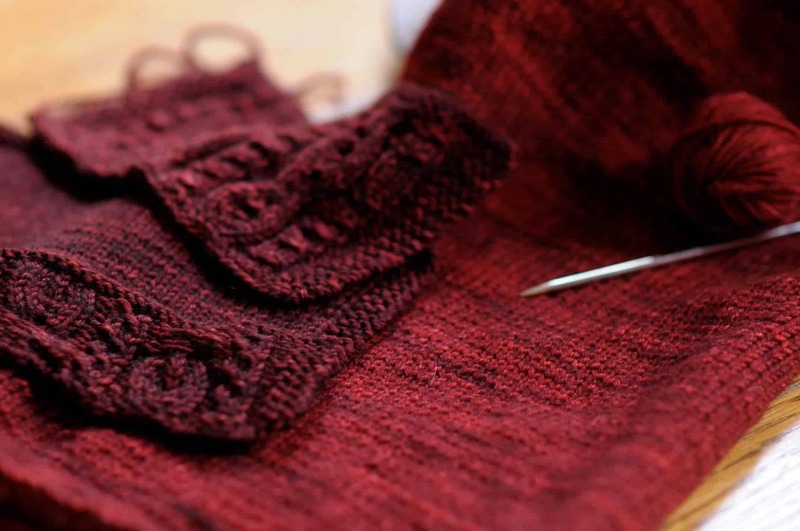 I picked up the needles and began to experiment with new yarns, colors, and more advanced patterns. 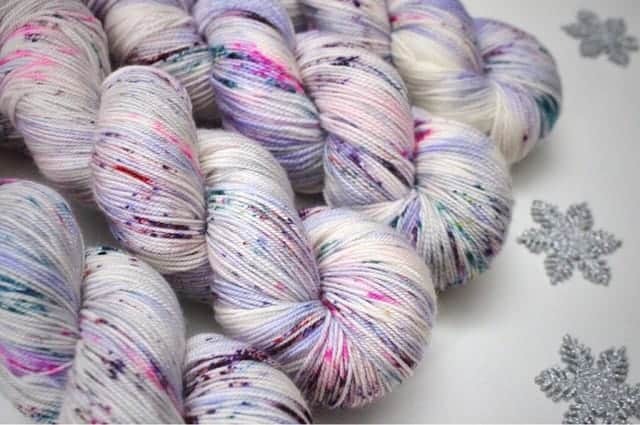 I loved how knitting, like fine arts, was about “problem solving,” taking all the parts (yarns/paints/skills) and making them work together to create something whole. I enjoyed the challenge, it was the reason I got into art in the first place. 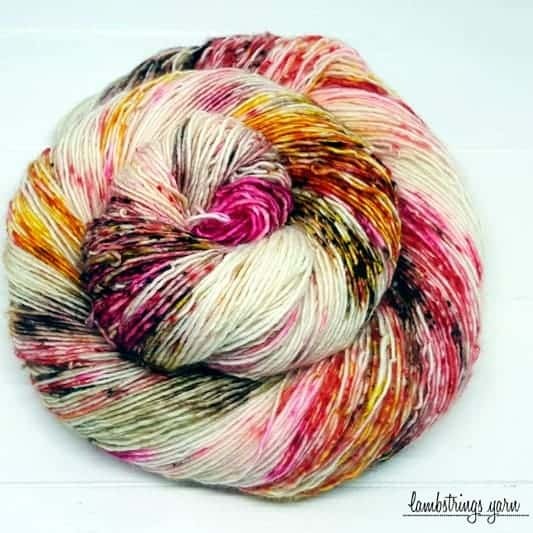 I quickly realized that I was interested in a specific spectrum of colors, and of course I was at the mercy of whatever colors I could purchase from other dyers. 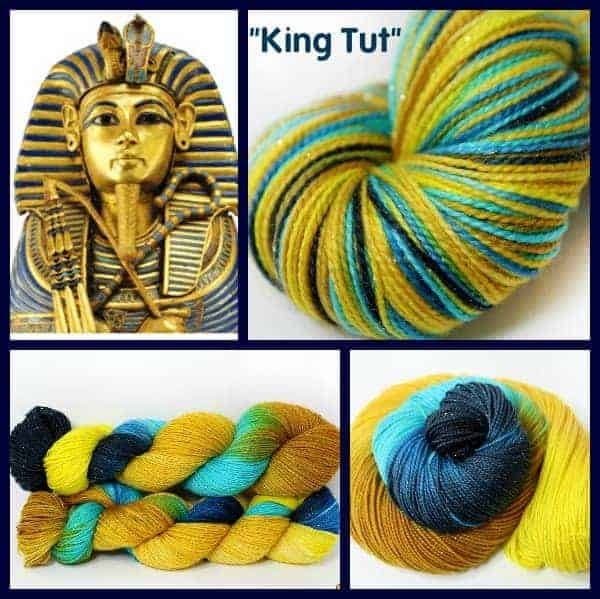 I thought “Hey, I could dye my own yarns, colors that I like and would want to use… after all, I have experience with color theory and mixing.” So I got myself some dyes and tools and started experimenting, I thought it was going to be a cinch, “yellow and blue make green.” Well no, not when you’re using acid dyes and mordants! This was not oil painting, this was a whole different animal of color mixing and behaved as such. I was going to have to learn color theory all over again, and call me crazy, but I was excited. I went all in, keeping a detailed notebook of color recipes and inspiration, and acquiring more and more dyes. 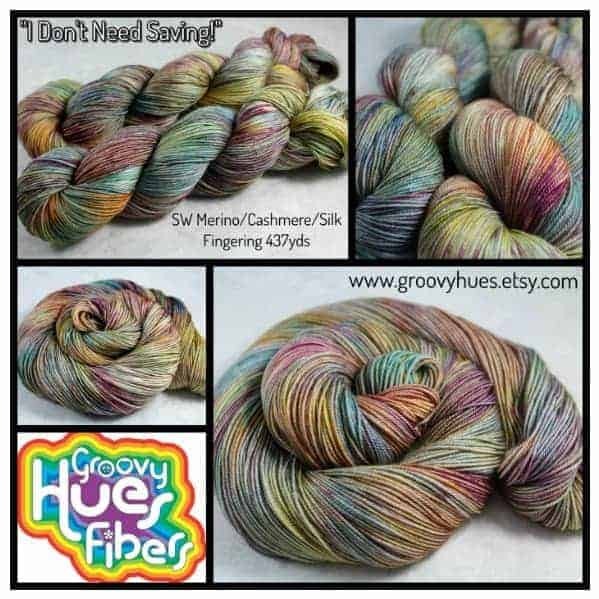 Over the next year I dyed A LOT of yarn with much success and some failure, ending up with more than I could ever use myself. Naturally the next step is to share what I’ve created with others. This is how I was going to get my art out into the world! I started my Etsy shop and had such a positive response from customers that I kept going. Inspiration comes from so many places. Nature, literature, nostalgia, and emotions are what most inspires my colors and names. Sometimes I get inspire by a mistake along the way, and a color that was meant to be one thing becomes something totally different. I love dark colors, the darker the better for my personal style, So I tend to dye darker than most. 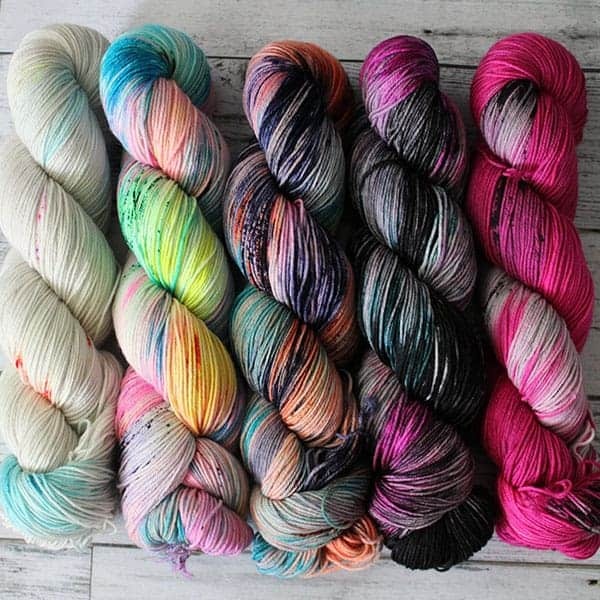 But yes, since I started dying yarn I’ve become more open to bright colors like pinks and pops of neon, and they’ve made their way into some of my colorways. My style tends to be dark and neutral with hints of color. Not one specific colorway, but greens — most greens — they just don’t like me. It is my most challenging color family to work with. 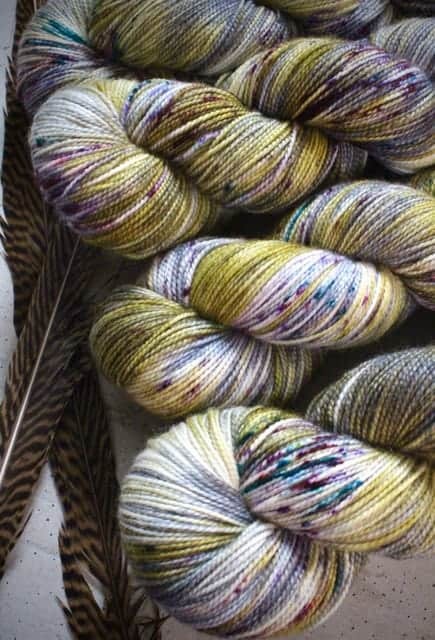 I have several successful and beautiful green based colorways, but the roads traveled to reach them were LONG and WINDY. Usually the shop is updated every two weeks. During busy seasons and holidays I will update weekly for customer convenience. 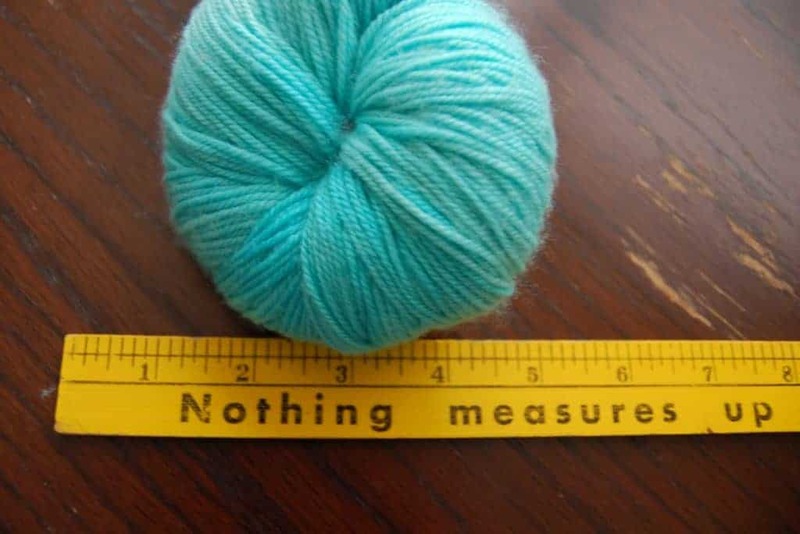 I worked full time for many years at a craft store as supervisor of the yarn department. 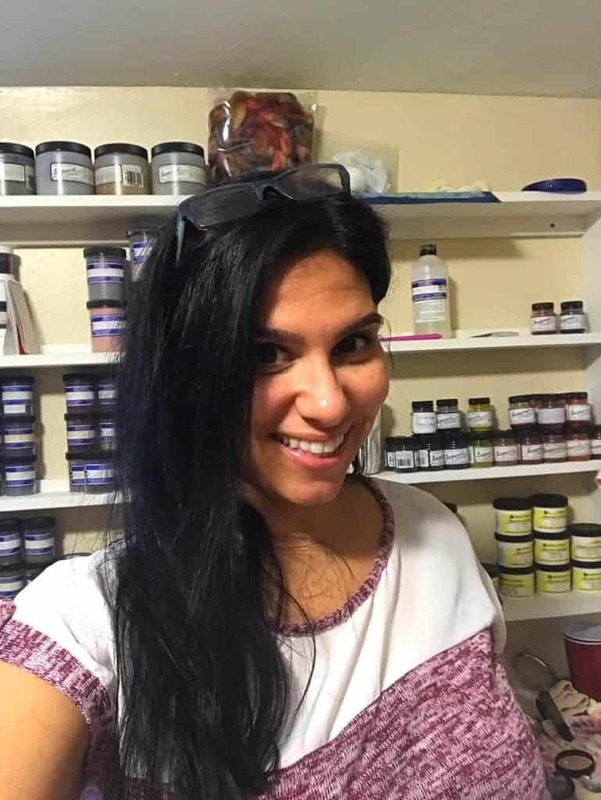 I now work there a few days a week and dyeing has become my main business. 1. 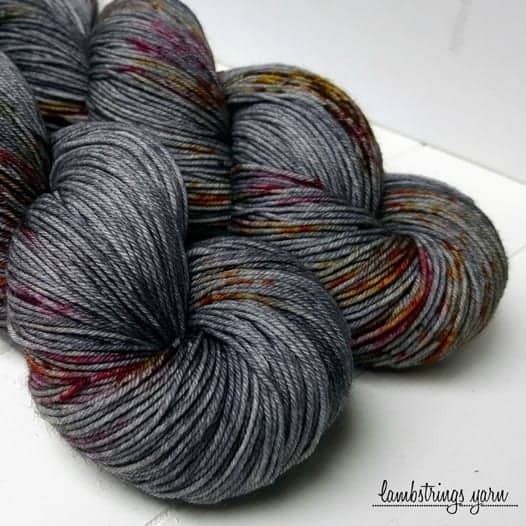 I knew the fiber community was strong, but I never knew just how wonderful it really was until I started Lambstrings Yarn. These are some of the most kind, generous, and supportive people I’ve ever met. And the enthusiasm, the fiber community LOVE what they do! I don’t think you find the same level of passion and enthusiasm anywhere else in the craft world. 2. In the creative world, if you don’t believe in what you do, it’s just not going to work. 3. I’ve learned how to be more confident. This is more of a personal growth, but it’s worth mentioning I think. 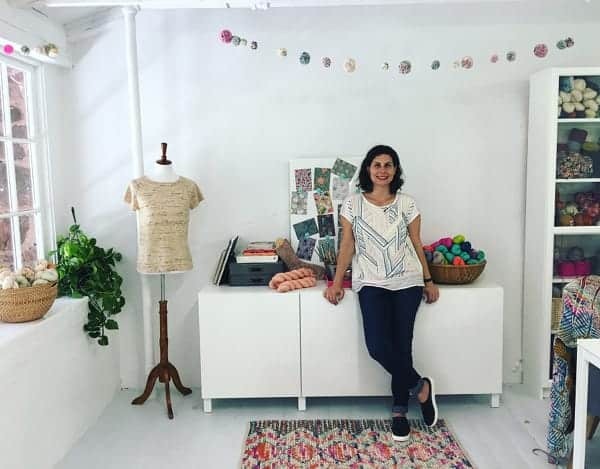 The level of self discipline and confidence it requires to be one’s own boss and really taking ownership of business decisions and yes, even setbacks, has spilled over into other aspects of my life. 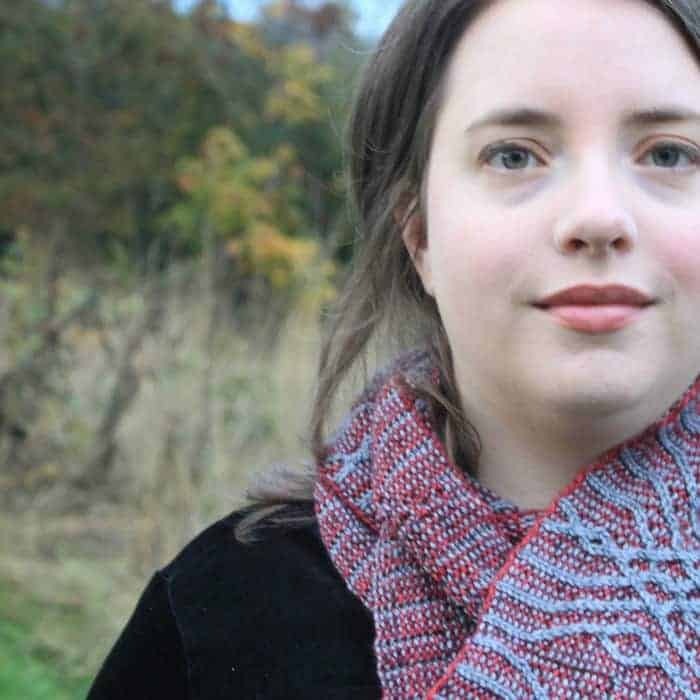 I went from being uncertain about this fiber venture in the beginning, to feeling like it’s the best thing I ever did.